Düsseldorf, 25 July 2018. Smart Home is much talked about! The ability to control devices in your home via app or voice command is considered the technology of the future. The interconnected, intelligent home ensures more security, saves valuable time and lowers energy costs. Smart Home helps to make everyday life more comfortable by relieving the homeowner of many control and monitoring tasks. With the help of motion detectors, the light comes on as soon as someone enters the room, with a certain amount of sunlight the blinds go down, and the room temperature is adjusted to the current circumstances – all this is what makes an automated home stand out. And even security-relevant tools such as burglary protection and fire prevention can also be controlled via smartphone. But how can we avoid water damages that lurk in the dark or happen so suddenly that a quick reaction is required? In more than half of households (54%), water damage incidents have occurred at least once. In Europe, repair costs due to water damage incidents amount to an average of € 2,297 , although 93% of the damage incidents could have been prevented by appropriate protection systems. 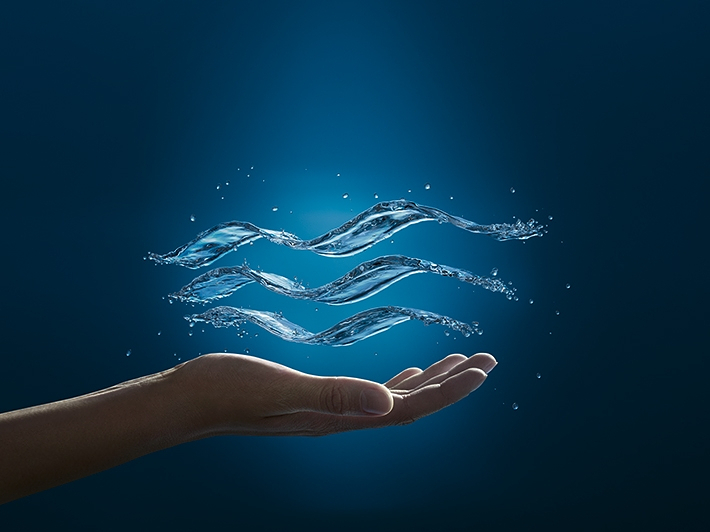 This is exactly where the smart water security system GROHE Sense and GROHE Sense Guard comes into play. The wireless-enabled sensors are to be installed in the basement, in the laundry room, in the bathroom or in the kitchen. The system notifies homeowners about any problems via the GROHE ONDUS App. With GROHE Sense and GROHE Sense Guard, GROHE, the world's leading provider of sanitary fittings, offers all-round protection against water damage: GROHE Sense is a smart water sensor that is placed on the floor and can detect water retention. If, for example, the bottom of the sensor comes in contact with water due to a leak, GROHE Sense will send out a warning alert to the GROHE ONDUS App. The alert is sent to the user and specific emergency contacts. The sensor also measures the room temperature and humidity and informs users in case of deviations from the standard amounts. Hence, homeowners are optimally protected against frost and mould risks. Installed by a professional installer directly to the main water pipe of a home, the smart GROHE Sense Guard control unit uses multiple sensors to monitor water pressure, system temperature, flow of water and general water consumption. It also conducts periodic micro leakage tests so that leaks can be detected immediately before major damage can occur. GROHE Sense Guard even goes one step further: In the event of, for example, a burst pipe, it automatically turns off the water supply when it exceeds a specific maximum. An app and a digital water profile: The GROHE ONDUS app is the heart of the GROHE Sense system. It provides the highest level of water security and allows continuous monitoring of GROHE Sense and GROHE Sense Guard – anywhere, anytime. Thanks to its smartphone alert feature, the app can also immediately shut off the water supply manually to prevent major damage. In addition, all measured data can be observed via app. It supports Apple mobile devices with the iOS version of 9.0 or higher and Android mobile devices with Android 4.3 or higher.